First line: "Michael K. knew his first day in a new school in a new city was going to be weird." 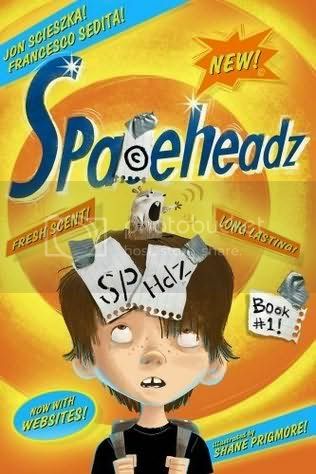 Scieszka is in rare form, with this fast-paced, humorous, science-fiction, middle-grade adventure. Newbie fifth-grader Michael K. gets stuck with the task of showing two other new kids, Bob and Jennifer, the ropes in Mrs. Halley's classroom. He quickly realizes that they are both out-of-this world... literally, from another planet. The only information that Jennifer, Bob and their hamster leader, Major Fluffy, have about planet Earth is from television commercials, beamed into space. Media-savvy readers will recognize many of the catchphrases and slogans that Bob and Jennifer employ in their conversation. The kids manage to stay one step ahead of bumbling Agent Umber of the Anti-Alien Agency despite his phalanx of super-spy gadgets, including the Pickle Phone, a box of cereal that turns into a laptop computer and a giant taco disguise. Some of the best story content is featured on accompanying websites, full of Easter eggs and additional jokes and information, including www.mrshalleyscomets.com. This website is a brilliant send-up of many teachers' poorly designed efforts, complete with plenty of clashing colors, busy patterns, flashing extras, Comic Sans font and cheery "inspirational" quotes. Agent Umber's somewhat official looking "government" website www.antialienagency.com has most links leading to an ominous pop-up reading, "Access Denied. You do not have sufficient security clearance to view this page." However, some careful poking around will lead to case file reports of The Fried Santa Incident, and a rather silly set of highly bureaucratic forms, including Shoe Replacement and Suit Pocket Addition Forms. Plenty of varying fonts throughout the book are sure to grab readers attention.